I think you should keep it open, write when you want about what you want and derive from that what joys you will. You said you enjoy it. That’s worth a lot!! The older we get, we realize that some things CAN be for the sole purpose of our own enjoyment or therapy. Having it on a blog allows that enjoyment to seep to others…and at this point, who really cares how far and wide it seeps! And you never know…Some day you could be the talk of the town for something you wrote!!! But not if you stop. Just my opinion. Thanks Lisa. I have decided to keep writing. I started this for myself, so why not continue something I enjoy? I think you should continue and do it whenever the mood hits you. Thanks Madge. I definitely am! Thanks! I am glad you read it!!! Thanks Suzanne!! I will definitely check out your blog! 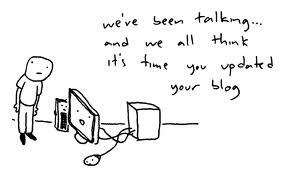 I agree about blogging on your own, it really is easier and gives more peace of mind. I hope you keep writing as well! Thanks Bev! I am going to keep going!! Hi there Carol. I am in a terrible state- choosing between continuing my blogging or not. Just to give a quick overview my main source of income is web content writing- ghostwriting, research, creating homepages, etc. Until last September I finally concentrate on creating a blog that is geared towards mainstream blogging. I’ve been doing this for over 6 months now ( I just realized that now) and get invited for many events- too many that I can no longer handle. Anyway, I get recognized and noticed by big PR companies and they would often send invitation for their events or send press release materials for me to post on my blog. Now, I am more active in attending prestigious events which have robbed my time for work. I spend so much for my transportation, for dressing up, food and so on just to keep up with my blogging social status. In other words I am about to be broke and jobless. I don’t know if I should continue and wait for projects that compensate or just stop and get back to working. I really enjoy going to different places and meeting new people at events it really brings out things that I just discovered about myself- my potential as a media person. But this is not my reality since I am not making a living out of it. I am so confused and would consider giving up on social media and get back to my own little corner- writing for others and getting paid little. HELP!